Allison Gryski: Which 6 orchids do you prefer? I'm working on selecting photos for my first photograph cards. You can see my prototype photo card, which I made yesterday. The actual ones will use the deckled (ragged edge) cardstock that I used for some of my stamped cards. What I want to know from you, dear reader, is which of the above orchid pictures would you like to see on a card and what type of set would you like. 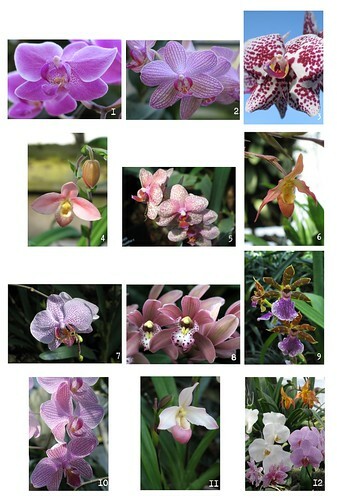 Please take the poll in the sidebar and select 1 type of set and up to 6 of your favourite orchid pictures. The last poll showed a "watering can" as the clear favourite for a new stamped design. I wonder if that's because we're all ready for spring and summer gardening. I know that's why the idea occurred to me. I'll be sure to post the design when it's ready. Deciding to buy something is largely influenced by the price. I might buy a whole set of 12 if I thought it was good value over just buying or 2. So imho, you need to have a ballpark figure for your price range even if it isn't final.